Murray came to East Norfolk in 1959 to “disappear” for a while after serving in Intelligence after the war. 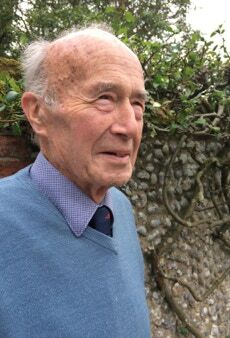 Still in his 20s - he was born in 1930 - Murray moved into farming and has farmed Mill Farm Happisburgh with his wife, a teacher, for most of his life. At boarding school since the age of 8 he was planning to go on to University at 18 to study Natural Sciences and Marine Biology- when the Service intervened. While he is silent on this, Murray has stories to tell about the pink footed goose, the badger and the deer. He got to know Hickling Broad and the Warden through sailing, and tells of feeding great flocks of coot and swan on the ice through the hard frozen winters on the Broad. For twelve years he was chair of the local NWT Group and talks about their central importance to the conservation effort. Geese gone - and back again!